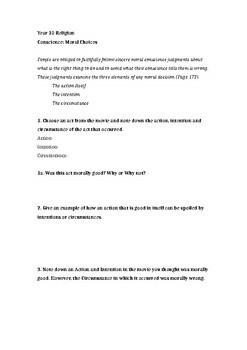 This activity sheet is based on Year 10 Religious Education Conscience. The activity focuses on the students understanding what makes a choice moral. The activity will require students to watch a movie or TV episode of choice and answer the questions that follow in the activity sheet. Please rate or leave a comment.